Spending a night in a treetop is an experience that fulfils your childhood dreams but at the Treehotel, you’ll do it in style and comfort. It is a special addition to your holiday that can also be quite surreal as you peer out to the untouched Lappish forests from your unique room. Several renowned architects ensured that the unusual, yet cutting edge design fits perfectly in this natural surrounding and all rooms were designed to make the most of the location. Some rooms, in fact, blend in so well that you could be standing beneath them without even realising that they are there. 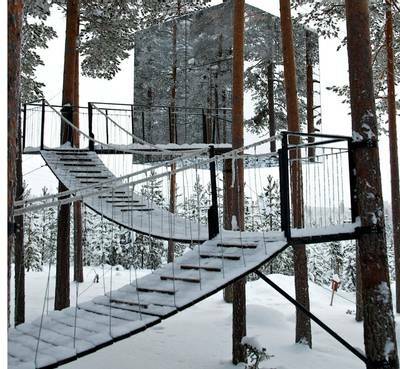 ‘Exclusive’ is a term used frequently in travel but with the Treehotel, it is perfectly fitting. With only seven rooms, all with a completely different design, a stay here really is an experience like no other. Each room has its own quirks but all provide a remarkable experience that can be appreciated in the winter and summer seasons. 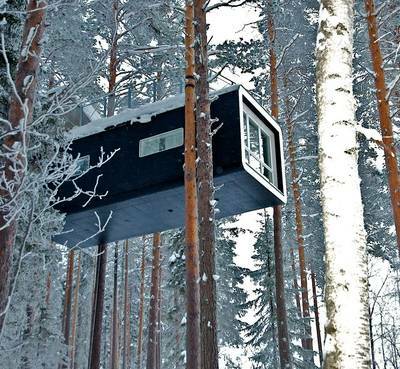 You could enjoy your treetop home in and amongst nature’s summer foliage or you may want to stay cosy in your unique room as you peer out into the snowy wilderness, searching for the Northern Lights in the sky above. This Scandi-style log cabin will impress even before you have stepped inside. As you draw closer to the room and look up, you’ll see that the entire underside is covered by a huge photograph of treetops, an ingenious camouflage. 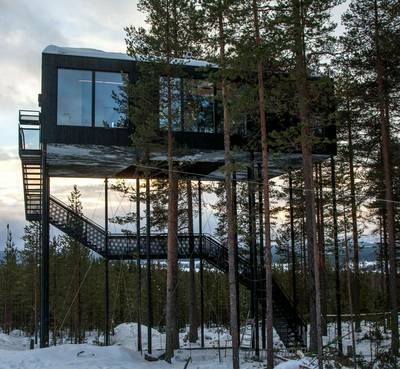 You will then walk up the stairs to reach the cabin, 10 metres up in the air. The inside has been furnished in a light and airy style and comes equipped with two double beds, a sofa bed, lounge and bathroom. Outside is a patio made entirely of net where you can lay and admire the stunning Swedish valley below. 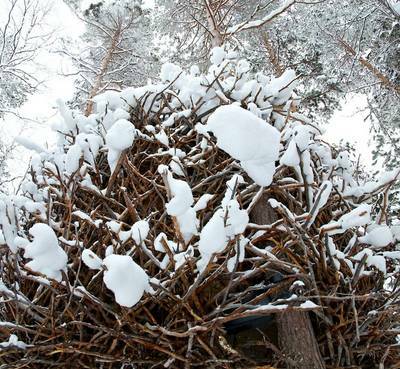 The Bird’s Nest is another room with a spectacular camouflage design. 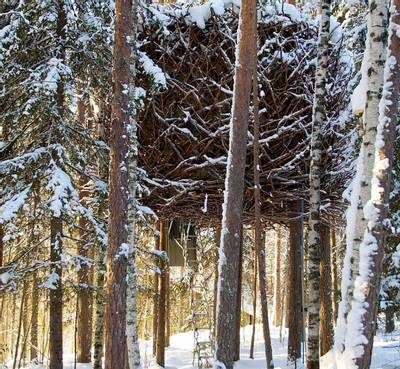 True to its name, the room is decorated to look exactly like a nest, sitting peacefully in the forest. From the outside, the windows are nearly invisible and the room is accessed by a narrow retractable staircase, therefore you need to have some confidence with heights and a level of agility. Inside, there are two separate sleeping areas – one double room and then bunk beds, which means it is suitable for friends or couples. The light interior coupled with the small circular windows makes this a brilliant retreat in the treetops. We recommend taking only the essentials to your rooms and leaving the rest stored securely at Britta's Pension. This room is a particular favourite among couples who want a romantic treetop retreat. 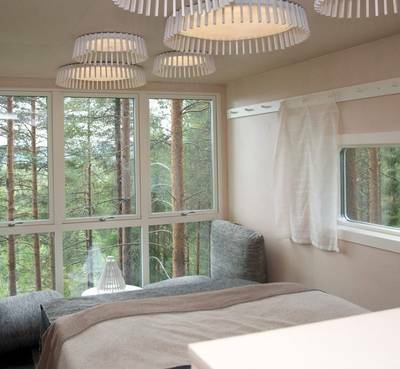 Located on a platform on a sharp hillside, guests will have brilliant views across the Lulea River Valley. There is a wonderful treetop terrace area to sit and enjoy the vistas and the cabin is easily accessed via a horizontal bridge. Inside, there is a double bed, toilet and large windows to soak up more of the views. As the name suggests, this room’s exterior is made completely from mirrors, meaning that it disappears in a camouflage created by the reflection of the landscape in the walls. It has also been covered in an infra-red film, which prevents birds from flying into it. The room is easily accessed by a 12-meter long bridge walk. Inside, the birch-clad and six windows create an incredible light feel. Couples can enjoy relaxing in the double bed and the lounge area of the rooftop terrace, accessed by a ladder. Oddly, the Blue Cone is actually a bright red building. It is a traditional wooden structure which doesn’t sit too far off the ground, so it’s perfect for those who want to experience a tree room without the heights. The inside is decorated minimally, letting the views do all the work. You can enjoy them from the seating area or you can relax in the double room or loft sleeping area with two single beds (accessible by ladder). This is one of the most accessible rooms as there is a bridge leading the way right to the front door. 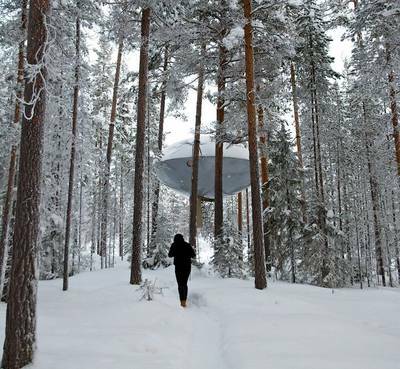 Designed to be in complete contrast with the forest surroundings, the UFO room is a spectacular modern creation. It is nothing short of surreal when you turn the key to release the access ladder which appears to a puff of smoke. Due to the narrow metal ladder, we recommend this room is for those who are comfortable with heights and are agile. Inside, you’ll be surprised that instead of an alien life form, you’ll find a comfortable interior. There are three single beds and one double bed to accommodate up to five people. You can also relax in the living area complete with your very own computer game, to complete the modern feel. We suggest taking only the essentials to the room and storing the rest of your luggage at Britta's Pension. The 15-metre long ramp provides relatively easy access to this stunning and spacious accommodation, ideally suited for those with a large party. Inside, you’ll find two rooms so it can easily accommodate two couples or an entire family. The panoramic windows help make the striking landscape part of the interior. You can sit at the large seating area to absorb the awe-inspiring views. A supplement is required when reserving The Dragon Fly, so please see pricing for further details. 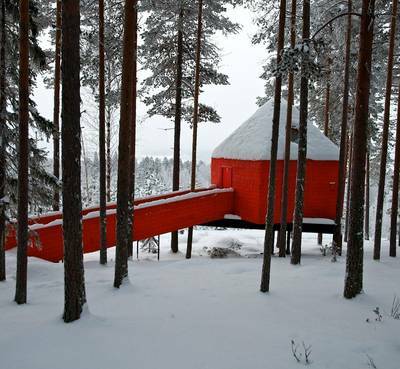 The Tree Sauna – take your relaxing holiday one step further with a trip to the Tree Sauna. Pay locally for a two-hour visit to the sauna and relaxation area. You can also rent a hot tub at an additional charge. Showers are in a separate building, just a couple of minutes’ walk from the rooms. All meals are served at Britta’s Pension (guesthouse) equipped with a cosy dining area for you to enjoy some local home cooking. It takes around 10 minutes to walk uphill from Britta’s to the area of the treetop rooms. Britta’s Pension is also the reception for the Treehotel, both are owned by Britta and her husband Kent. The couple are extremely passionate about the local area and their wonderfully innovative accommodation.